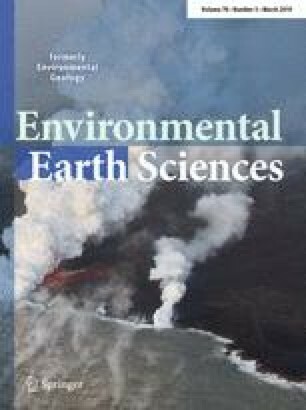 The acoustic-emission (AE) nondestructive monitoring method was used to investigate the deformation–failure of Longmaxi marine shale samples from the Sichuan Basin in uniaxial compression tests. Millions of AE ring counts were recorded by six sensors that were mounted on the surface of cylindrical specimens. The AE ring counts rate and energy rate were applied to study crack development during fracturing. AE locations at different stress stages during the loading process were obtained to study the fracture spatial distribution and the crack-propagation tendency. An X-ray computed tomography (CT) system was used to scan samples after damage. CT images were reconstructed to acquire three-dimensional pictures that show the internal invisible-fault system. The combination of AE method and CT technique helps explain temporal and spatial crack evolution. Variable damage evolution was determined by the number of AE ring counts, which demonstrates the degradation behavior of shale. This work was supported by the Strategic Priority Research Program of the Chinese Academy of Sciences (Grant number XDB10030302).